In February, 1879, there ap­peared an article in this magazine entitled "Aerial Navigation (a priori)," by Edmund Clarence Sted­man, in which certain sug­gestions were made in regard to the possibility of navigating the air by means of fish shaped or cigar shaped balloons operated by screw-pro­pellers driven by some species of motor. The writer did not claim to be an engineer; he only held out to engineers certain suggestions which he believed were possible of attainment. Since that time, however, the identical apparatus which he suggested has been very extensively experimented with by the French Government. The culmination of all these experiments has resulted in the construction of the fish shaped balloon called La France, which is propelled by a screw driven by an electric motor, the source of electricity being a storage battery. This balloon has actually ascended several times, and has returned and landed at its start­ing point. But this was in a dead calm; only on rare occasions has it been possible to return to the starting point. The experiments on La France have really been conducted by the French War Depart­ment with the view to obtaining a balloon which could be controlled sufficiently to reconnoiter an enemy's position and return within the lines. These experiments have been conducted by the ablest of French engineers, supplied with un­limited means and with all the resources of science at their disposal; every advantage has been taken of all the experience of those who have conducted similar experiments before them. They have probably worked out the problem to as high a state of efficiency as it will ever be possible to arrive at with a balloon; still the result is most unsatisfactory. A balloon must of necessity be of less density, considered as a whole, than the air in which it floats, and consequently must be of an extremely bulky and fragile nature. It is quite as impossible to propel a balloon with any considerable degree of velocity through the air as it is for a jelly­fish to travel through the water at a high rate of speed. All recent attempts in this country to navi­gate the air, of which so much has appeared in the newspapers, have simply been imitations of the French balloon La France, and very sorry imitations at that. In all nature we do not find any bird or insect which navigate& the air after the manner of a balloon. Every living creature, bird, or insect which has been able to raise itself from the earth and to propel itself through the air has a body: many hundred times heavier than the same volume of air,and is endowed with the power of ex­erting great mechanical force in proportion to its weight. It is the expending of this physi­cal force upon the surrounding air that enables it to fly. But the actual force required by birds in their flight has until recently been largely a matter of conjecture. Many unsatis­factory attempts have been made with dyna­mometers attached to the bird itself to measure the force of its muscles, but very little of value has been accomplished in this direction. Ma­thematicians without number have invented formulae and discussed the question of flight, but the most remarkable feature has been the difference in the results arrived at. Many years ago a mathematician in France wrote a trea­tise in which he proved that the common goose in flying exerted a force equal to 200 horse-power; another proved that it was only 50 horse-power, and he was followed by still another who proved very much to his own satisfaction that it was only 10 horse-power. Later on others have written to prove that a, goose expends only about 1 horse-power in flying. At the present time, however, many mathematicians, can be found who are ready to prove that only one-tenth part of a horse-power is exerted by a goose. I do not know on what basis the earlier writers came to their con­clusions. Those who proved the flight of a goose about 1 horse-power in energy have figured it on the following basis: Suppose a goose to weigh 12 pounds, the wing surface being only slightly over 3 square feet - the wings alone being the only supporting power while flying. Such a goose would fall through the air, provided it made no motion with wings, at the rate of about 26 miles per hour or say 2300 feet per minute. They claim that the goose in flying must therefore perform work which is equal to raising its body 2300 feet per minute, or as fast as it would fall if it made motions with its wings. It is quite true if a plane having a surface of 3 square feet should be loaded with 12 pounds that it would fall through the air at the rate of 2300 feet per minute, and if air was propelled by mechanic energy against the bottom side of this plane with sufficient force to hold it in equilibrium and prevent it from falling, the energy required to propel this column of air would be equal to lifting 12 pounds 2300 feet per minute. The conventional unit of energy in England and America is 1 pound raised 1 foot high;'1 should therefore have 12 pounds X 2300 as the energy in foot-pounds, which would be 27,600 foot-pounds in 1 minute of time. Now as it requires 33,000 foot-pounds for 1 horse-power, they claim that it follows that a 12-pound goose flying exerts .83 horse-power. This, however, is wide of the truth. In my experiments I have found that the advantages arising from moving forward on to new air, the inertia of which has not been disturbed would reduce the energy required to less than one-tenth part of this, because the air underneath wings would not yield one-tenth part as much if the goose were moving forward at a high velocity, as it would if the goose remained in the same position and flapped its wings with sufficient energy to sustain itself in the air without moving ahead at all. The goose would, therefore, exert no more than .083 of a horse-power which is rather more than half a man-power and is at the rate of 144.5 pounds to the horse power. With other birds, such as the albatross and the turkey-buzzard, where the wing surface is very much larger in proportion to its weight than that of a goose, and where the angle of the wing is much flatter, the amount of power actually required, per pound of weight, is much less. Professor Richard A. Proctor wrote an article. which appeared in the "British Mechanic" some years ago, in which he assumed a certain hypothesis in the flight of birds, and which was widely copied and created a great deal of in­terest in Europe. He claimed that birds in fly­ing did not exert anything like the power which some scientists had supposed, and that the ad­vantages of moving rapidly forward on to new, undisturbed air were such that a bird did not exert power greater than that used by some land animals in running. He did not attempt to give the exact amount of energy expended, but his reasoning was very near the truth. Later on Professor Proctor visited America, and while in Florida had ample opportunities of observing and studying the flight of the turkey-buzzard. He then wrote another article, which appeared in the "Boston Globe," in which he proved that the flight of the turkey­-buzzard could not be accounted for except upon the hypothesis that its wings did not rest upon the same air a sufficiently long time to have that air perceptibly set in motion. He claimed that he had observed these birds rest for many minutes at a time upon the air with­out any perceptible motion of their wings. They were, however, continually moving for­ward through the air at a high rate of speed. The same phenomena in regard to the flight of birds have been carefully observed and noted in all parts of the world by many en­gineers an 'scientists, and they have all arrived at the same conclusions. While all recent sci­entific observers have practically agreed with Proctor, none have experimentally proved the exact amount of power required to perform flight. The wings of a bird in flying perform a two­fold function. They form primarily an aero­plane which supports the body after the manner of a kite, and, secondarily, a propeller for driving the aeroplane forward. I think all scientists are agreed ,that if we are ever able to navigate the air it must be on the aeroplane system; that is, the weight of the machine and passenger or pas­sengers must be carried by a large plane driven at a high velocity through the air. There is, however, some difference in opinion in regard to the proper manner of propelling these planes. Some of the less scientific, who wish to imitate nature as far as possible, think it would be necessary to imitate the wings of a bird, while others propose the use of a screw similar to those used in propelling steamships, but of course made much lighter in proportion to their size. I am in favor of a screw-propeller, because with it I find a high degree of efficiency, and the possibility of applying a large amount of force in a continuous manner without any vi­bration or unsteadiness in action. The unsci­entific man claims that all birds and insects fly by flapping their wings; consequently, the suc­cessful flying machine will have to be provided with wings that flap. Others claim that in all nature we do not find birds which weigh over fifty pounds; consequently, no successful flying ­machine will ever be made that weighs over fifty pounds. In answer to this it might be said that the horse as well as the bird is a very beautiful and highly organized animal, and in its mo­tions we observe the highest degree of efficiency for the power expended; still, if we had at­tempted to build our locomotives on the plan of a horse, and had limited ourselves to the weight of the largest quadruped, we should probably have succeeded in making locomo­tives which would weigh five tons - the weight of an elephant - and walk five miles an hour, By the use of the rotating wheel on the locomo­tive, together with its great weight and size, we have been able to apply an enormous amount of power in a continuous manner, and the result is that we not only equal the horse but we very much surpass him both in power and speed. The nautilus, which weighs only a few ounces, is the only animal known which sails upon the face of the water after the man­ner of a ship. Nevertheless, sailing ships which are successful in a very high degree weigh thousands of tons. The largest animal which swims in the sea weighs seventy-five tons, and is probably able to travel at the rate of twenty miles an hour for twenty-four hours at a time, while we have many steamships which weigh 10,000 tons, and which are able to travel at an equally high rate of speed for fifteen days at a time. It is quite true that artificial machines do not develop so much power per pound of carbon or food consumed as do animals or natural ma­chines; still the highly concentrated character of the fuel - such as coal or petroleum - em­ployed in artificial machines more than com­pensates for this difference. It is safe to say that there is twenty times as much energy in one pound of petroleum as in twenty pounds of vegetation, fish, or animal matter. In order to ascertain the amount of energy re­quired for flying, and also to ascertain what in­fluence, if any, the factor of size has upon flight, I have constructed a very elaborate apparatus by which I am able to test the efficiency of vari­ous kinds and forms of screws, and the lifting power of aeroplanes of various sizes and shapes set at various angles. M y apparatus consists of an arm 31 feet9.9 inches long, mounted upon a strong vertical steel tube, provided with ball bearings so as to eliminate as far as possible the element of friction. The arm, as will be seen in the engravings, is made double, the edges being sharp, so as to offer as little resistance as possible to the air. To the end of this long arm is attached what might be termed a small flying machine, which is provided with a shaft, the center of which is exactly 31 feet 9.9 inches from the center of the steel tube on which the long arm revolves. It would, therefore, describe a circle exactly 200 feet in circumference. The power to operate the screw-shaft of the flying­ machine is transmitted by suitable gearing through the central tube and the two mem­bers of the long arm, the screw-shaft being free to move in a longitudinal direction, its move­ment, however, being opposed by a spiral spring. Upon attaching a screw to the shaft, and rotating it at a high rate of speed, the flying machine was free to move around a 200­ foot circle. Whatever the push of the screw was, the spiral spring was correspondingly com­pressed, and suitable apparatus recorded the push in pounds on a large scale attached to the framework which carried the arm, and which could readily be observed while the apparatus was in motion. Attached to the flying machine was a series of levers arranged after the man­ner of platform scales, and to which the aero­plane could be attached at any desired angle. A small steam engine, which could be readily run at any desired speed, furnished the power. A tachometer recorded the number of revolu­tions made, and a dynamometer the amount of energy expended. In order instantly to observe the speed, or to be able instantly to arrive. at any desired speed, the machine was provided with a large glass tube connected in such a manner that as the speed increased red liquid rose in the tube. On one side of the tube was a scale divided into miles per hour, and on the other a scale divided into feet per minute. When the screw was attached and the en­gine started, the arm at once began to travel around the circle, and by manipulating the throttle valve of the engine any desired speed could be obtained up to ninety miles an hour. By allowing the arm to travel, the push of the screw while advancing into fresh air could also be accurately obtained. In order to ascertain the lifting power of an aeroplane, it was attached at the desired angle, the cor­ners being stayed with wires to prevent twist­ing or breaking. It was not attached in the middle to the machine, but the inside end was longer than the outside end, just sufficiently so to make both ends lift equally. The levers to which the plane was attached were con­nected to a dynamometer arranged in such a manner that the lift could be observed while the apparatus was running. In order to arrive at the amount of power required to drive the plane, correct observations were made before the plane was attached. In this way I was able to ascertain the exact amount of energy required to drive the arm and all its attach­ments through the air, and then, by attaching the plane and running the machine until ex­actly the same speed was attained, the differ­ence in the readings showed the exact amount of energy required to drive the plane. The screws used were of wood and varied in di­ameter from 17.5 inches to 25.4 inches. About fifty different forms of screws were experimented with, some with four blades, some with two, some plain, and others with increasing pitch. 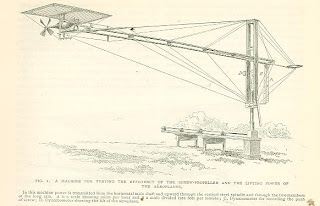 The whole apparatus to which the flying ma­chine was attached, including the long arm, its counterweight, stays, dynamometer, levers, etc., weighed about 800 pounds and offered con­siderable resistance to the air. An aeroplane made of thin wood 12 feet 10 inches long and 26 inches wide, driven side­wise, having the underside curved a quarter of an inch and placed at an angle of 1 in 13, and driven at a rate of 3500 feet per minute, lifted a load of 53 pounds, the push of the screw being 8 pounds. Upon removing the plane and running the machine at exactly the same speed, the push was reduced to 4 1/4 pounds; the difference between 8 and 4 1/4 pounds was, therefore, the amount of energy consumed in driving the plane, which would be 3 3/4 pounds. The energy in the difference of push was 13,125 foot-pounds, which is at the rate of 133.2 pounds to the horse-power. 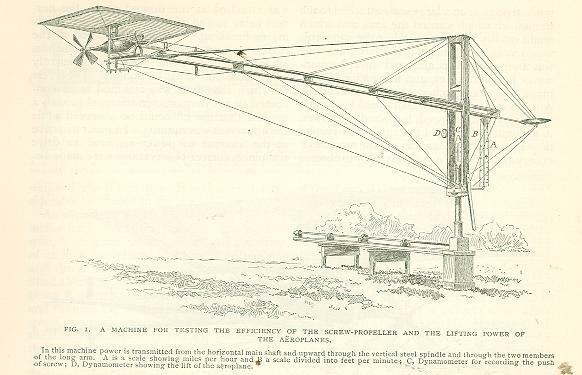 The same aeroplane placed at an angle of 1 in 12, and driven at the rate of 4400 feet per minute, carried a weight of 100 pounds, and upon attempting to increase the speed the wire stays which held the ends down were broken. The plane was very much distorted while traveling at this speed, so that the actual angle could not be definitely deter­mined. It carried 60.9 pounds to the horse­power. With an aeroplane 6 feet long and 12 inches wide, placed at a very flat angle and driven at a very high speed, as much as 250 pounds were carried to the horse-power. But the angle was so flat that it was difficult to maintain it, as the plane trembled, and at times was badly distorted by the air pressure. All the experi­ments went to prove that the most favorable results were produced when the angle was flat and the speed high. In regard to the efficiency of screws, it was found that a two bladed wooden screw, 25.4 inches diameter, of slightly increasing pitch, the mean pitch being 36 inches, when driven at a speed of 2333 turns per minute, pushed 11 pounds through a dis­tance of 5700 feet per minute. A similar screw, 17 1/2 inches diameter, with a mean pitch of 24 inches, driven at a speed of 2800 turns a minute, gave a push while standing still of 8 pounds, and when allowed to ad­vance at the rate of 3700 feet per minute gave a push of 5 pounds. All well made screws were found to be ef­ficient. The screw which gave the worst results was made exactly like those em­ployed in the experiments of the French Government. 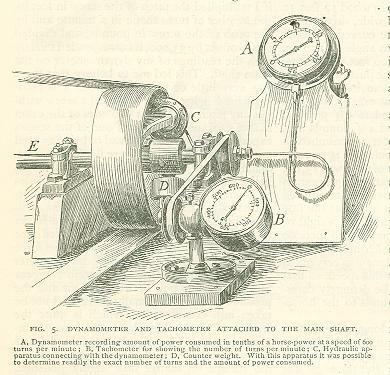 In conducting my experiments I found that if I multiplied the pitch of the screw in feet by the number of turns made in a minute and by the push of the screw in pounds, and divided this product by 33,000, it corresponded exactly with the readings of my dynamometer on the main shaft. This led me to believe that there was very little or no skin friction. I accord­ingly made what might be called a screw with­out any pitch at all, that is, blades of the exact shape, size, and thickness of one of the screws experimented with, but instead of being twisted and set at an angle, they were flat blades, each blade forming a sector of a disk, both edges being made very sharp, exactly like the blades of a screw. Upon testing this, I found, not­withstanding that my apparatus was so deli­cate that the touch of the end of the finger to the screw-shaft perceptibly moved the pointer on the dynamometer, that the force required was so small that the dynamometer failed to record it. It would therefore appear that the skin friction between the air and the polished surface is so small that it need not be taken into consideration, which is quite the reverse of what takes place with screws run­ning in water. This may be accounted for as follows; water wets the screw and sticks to the surface no matter how highly polished, while air, by not sticking to the surface, offers practically no resistance. In trying my experi­ments, not withstanding that the circle around which the planes traveled was 200 feet in cir­cumference, it was found, after the aeroplanes had been running a few minutes, that the air under them was perceptibly traveling down­ward around the whole circle, especially so when large planes were run at a high speed. I am therefore of the opinion that if my apparatus had been running in a straight line, so that the air was wholly undisturbed, the angle could have been much less, and the power consumed correspondingly reduced. Experiments which were tried while the wind was blowing went to prove the correctness of this theory. Often when the wind was blowing, the lift of the planes was sufficient to break the stays which secured them to the machine, and this not with­standing that the angle was very flat at the time. This was especially observed while the aeroplane was passing over the windward side of the circle where the air had not been dis­turbed, a plane 8 feet long and 3 feet wide often lifting momentarily as much as 200 pounds. Professor Langley, in discussing the question of flying, is reported to have said that with a flying machine the greater the speed the less would be the power required. Some engineers less scientific than the professor have attacked him upon this point. Engineers familiar with the science of navigating water by steam power would be apt to suppose that the same laws came into play in navigating the air as in nav­igating the water. This, however, is not true. It is a well-known fact that if it requires 10 horse-power to drive a steamboat 10 miles an hour, it will require 80 horse-power to drive it 20 miles an hour. This may be accounted for in the following manner. If the speed of a boat be 20 miles an hour, it will strike twice as many pounds of water per minute, and each pound twice as hard, as when driven 10 miles an hour. It will consequently require four times the amount of energy to drive the boat a given distance, and as the engine only has half as much time to develop four times as much energy, it follows that it must be eight times as strong. In navigating the air, however, we may reason as follows: if we make no allowance for skin friction and the resist­ance of the wires and frame­work passing through the air, these factors being very small indeed at mod­erate speeds as compared to the resistance offered by the aeroplane, we may assume that with a plane set at angle of 1 in 10, and with the whole ap­paratus weighing 4000 pounds, the push of the screw would have to be 400 pounds. Suppose now that the speed should be 30 miles an hour; the en­ergy required from the en­gine in useful effect on the machine would be 32 horse­power. Adding 20 per cent for slip of screw, it would be 38.4 horse-power. Suppose now that we should increase the speed of the machine to 60 miles an hour, we could re­duce the angle of the plane to 1 in 40 instead of 1 in 10, because the lifting power of a plane has been found to increase in proportion to the square of its velocity. A plane traveling through the air at the rate of 60 miles an hour, placed at an angle of 1 in 40, will lift the same as when placed at 1 in 10 and traveling at half this speed. The push of the screw would therefore have to be only 100 pounds, and it would re­quire 16 horse-power in useful effect to drive the plane. Adding 10 per cent for the slip of the screw, instead of 20, as for the lower speed, would increase the. engine power required to 17.6 horse-power. These figures of course make no allowance for any loss by atmospheric friction. Suppose 10 per cent to be consumed in atmospheric resistance when the complete machine was moving 30 miles an hour, it would then require 42.2 horse-power to drive it. There­fore at 30 miles an hour only 3.84 horse-power would be consumed by atmospheric friction, while with a speed of 60 miles an hour the en­gine power required to overcome this resistance would increase eight-fold, or 30.7 horse-power, which, added to 17.6, would make 48.1 horse­power for 60 miles an hour. If, however, the element friction could be completely removed, the higher the speed the less would be the power required. My experi­ments go to show that certainly as much as 133 pounds can be carried with the expendi­ture of 1 horse-power, and under certain con­ditions as much as 250 pounds. Some writers who have based their calculations altogether on mathematical formulae are of the opinion that as much as 500 pounds can be carried with 1 horse-power. From the foregoing it would appear that if a machine with its motor complete can be made to generate 1 horse-power for every 100 pounds, a machine might be made which would successfully navigate the air. After studying the question of motors for a good many years, and after having tried many experiments, I have come to the conclusion that the greatest amount of force with the minimum amount of weight can be obtained from a high pressure compound steam engine using steam at a pres­sure of from 200 to 350 pounds to the square inch, and lately I have constructed two such engines each weighing 300 pounds. These en­gines, when working under a pressure of 200 pounds to the square inch, and with a piston speed of only 400 feet per minute, develop in useful effect in push of screws over 100 horse­power, the push of the screws collectively being over 1000 pounds. By increasing the num­ber of turns, and also the steam pressure, I believe it will be possible to obtain from 200 to 300 horse-power from the same engines and with a piston speed no greater than 850 feet per minute. These engines are made through­out of tempered steel, and are of great strength and lightness; the new feature about my mo­tors, however, is the manner of generating steam. The steam generator itself, without the casing about it, weighs only 350 pounds; the engine, generator, casing, pumps, cranks, screw-shaft, and screws weigh 1800 pounds, and the rest of the machine as much more. With a sup­ply of fuel, water, and three men, the weight will not be far from 5000 pounds. 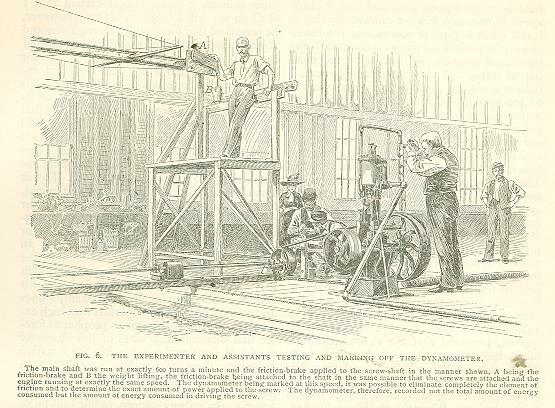 As the fore­going experiments have shown that the load may be fourteen times the push of the screw, it would appear that this machine ought to carry a burden, including its own weight, of 14,000 pounds, thus leaving a margin of 9000 pounds, provided that the steam pressure is maintained at 200 pounds to the square inch. The steam generator is self-regulating, has 48,000 brazed joints, and is heated by 45,000 gas-jets, gas being made by a simple process from petroleum. When the machine is finished, the exhaust steam will be condensed by an at­mospheric condenser made of a great number of very thin metallic tubes arranged in such a manner that they form a considerable portion of the lifting surface of the aeroplane. The greater part of the machine is constructed from thin steel tubes. I found that these were much more suitable for the purpose than the much. talked of aluminum; still I believe that if I should succeed in constructing a successful machine it would lead to such improvements in the manufacture of aluminum products that it will be possible to reduce greatly the weight of the machine. The questions of keeping the machine on an "even keel," of steering, and of landing, have been duly considered and provided for, but a description of these would be premature before the machine has actually been tried. Of course I hope to succeed, and from the data obtained from the foregoing experiments, and from the information I have obtained from other sources, it seems almost certain that I shall do so; still I may not. It may, however, be remarked that for many years engineers and scientists have admitted that the navigation of the air is certain to come so soon as a motor could be discovered which had sufficient energy in proportion to its weight. This motor has been found; its power has been tested, and its weight is known. It would therefore appear that we are within measurable distance of a successful machine for navigating the air, and I believe it is certain to come within the next ten years whether I succeed or not. Many ask what use it will be put to in case it does succeed. To this I would reply, certainly not for carrying freight, and not, for a considerable time at least, for carrying passengers. 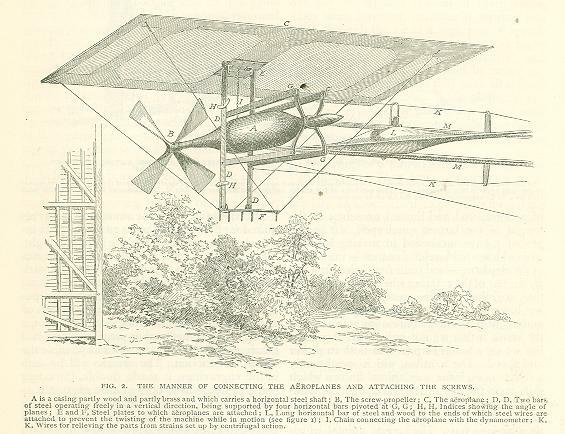 When the first flying machine succeeds, its first great use will be for military purposes. It will at once become an engine of war, not only to reconnoiter the enemy's positions as has been attempted with the so called dirigible balloons, but also for carrying and dropping into the enemy's lines and country large bombs charged with high explosives. It does not require a prophet to fore­see that successful machines of this character would at once make it possible for a nation possessing them to paralyze completely an enemy by destroying in a few hours the im­portant bridges, armories, arsenals, gas and waterworks, railway stations, public buildings, etc., and that all the modern means of defense both by land and sea which have cost untold millions would at once be rendered worthless. Of course this mode of warfare would not do away completely with all forms of small firearms, which would still have to be used in order to enable these future engines of war to combat one another; but it is safe to assert that none but small and light guns would be used. Flying machines of the future will of neces­sity be of a complicated and delicate nature, and will require the very highest order of sci­entific and mechanical skill to construct and operate them. France is today the only coun­try in the world which has the plant and in which it would be possible to manufacture all the material and to construct a machine such as I am now experimenting with. Flying­ machines will therefore be employed only by the rich and highly civilized nations. Small nations and half-civilized tribes will still have to content themselves with their present mode of warfare. Originally published in the Century Magazine. 1891.